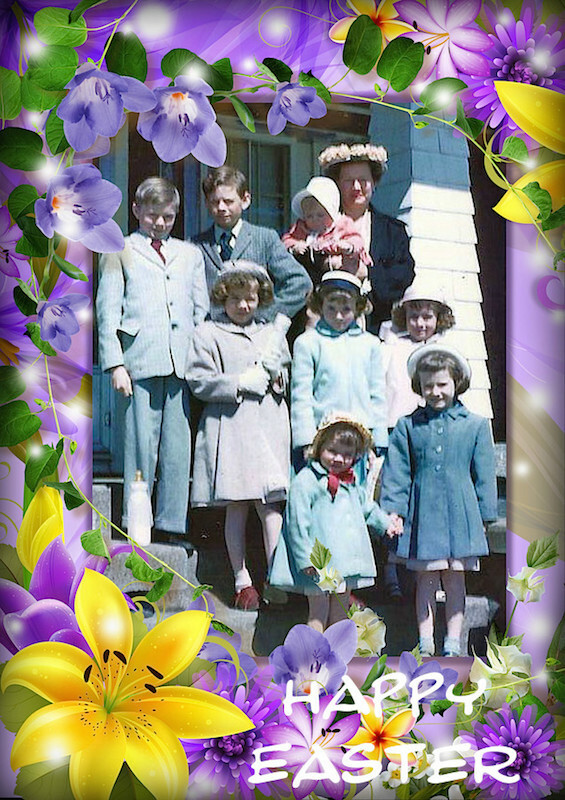 I want to wish you all a Happy Easter and blessings to you and your family. This is an old photo of my family, I am the baby. 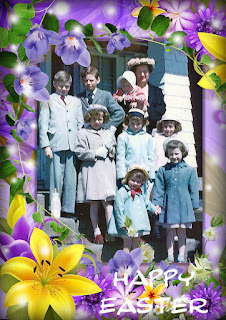 We look like the Kettle family, for those who remember the Ma an Pa Kettle family, lol. I am not sure what we will be doing for Easter. I am still recovering from my infection and the meds, so not up to cleaning and cooking for a large group. I asked my son to host and he said yes, then he tells me we are eating at Ivy's friends. I like her friend and children and enjoy spending the holidays with them, but the last time she cooked, they all got sick. So, I really doubt she will have anything I can eat and with the extra kids, it might be too much for me, we may just eat at home and go to the beach. Speaking of the beach, it seems that is where we spend most of our free time. 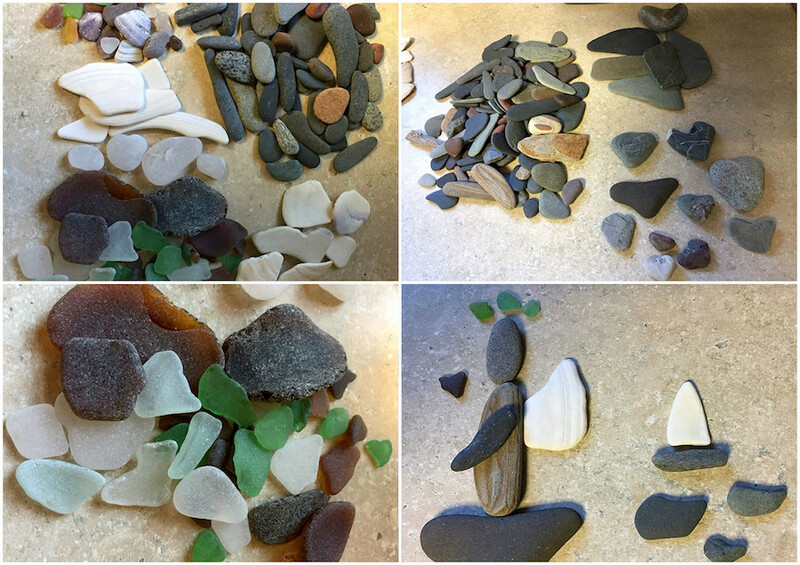 I love walking on the beach and the fresh air and of course, finding new treasures for my collection. This week we spent a few days at the beaches near the old navy base. One beach has some nice glass and the other has a nicer beach and much stranger glass. I found some large pieces and the bottle in front, that looks like it has been melted down, have never seen something like that. 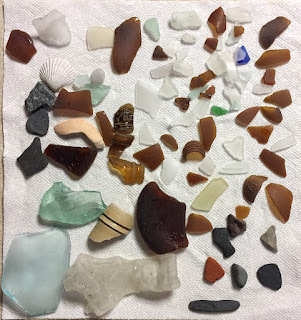 Today we spent a few hours in Jamestown, the best beach for older glass. 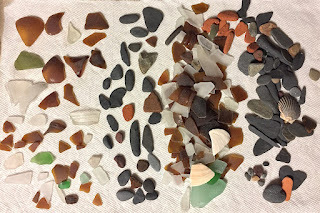 It was a bit dismal out, but warmer, so I spent a lot of time digging in the piles of rock and found some nice smooth and rounded pieces. It was nice to get out without freezing, but I got hit twice with incoming waves, so that did me in. Bending and squatting is killing my back, but I was having too much fun to care. Hopefully a good nights sleep will have me all ready for a new beach tomorrow. 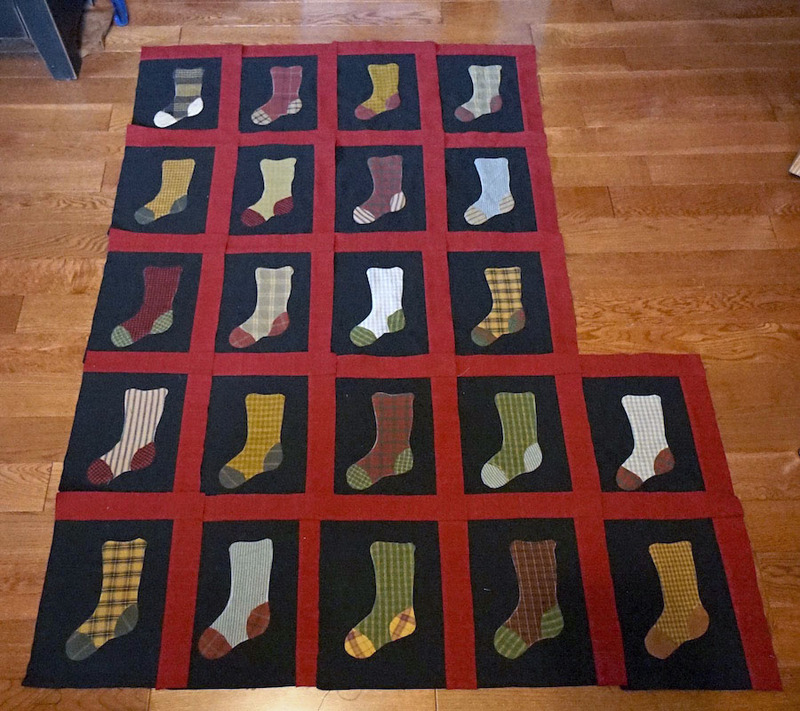 I am also working on my stocking quilt, a few more blocks to go, then I will sew them together to see what I have for size. I would like to finish the top before we go on our camping trip in two weeks, then I can hand quilt this one, while I relax at camp. 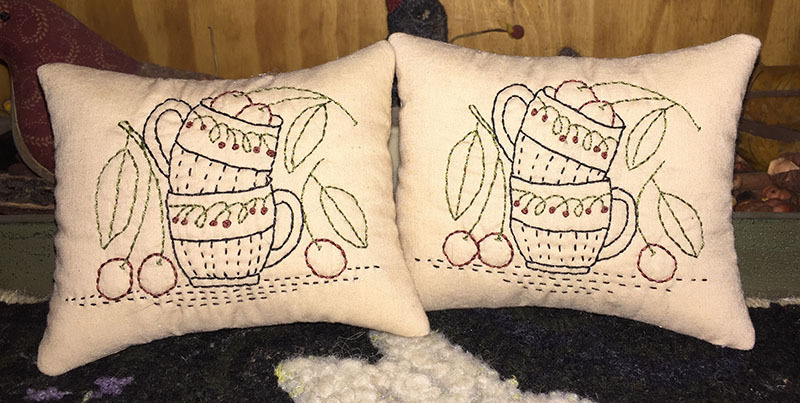 This past week I was working on some small stitcheries offered by Theodore Cleave. 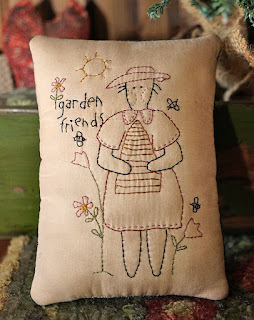 She lists free stitcheries from time to time and I still have to make my garden ladies into a quilt. 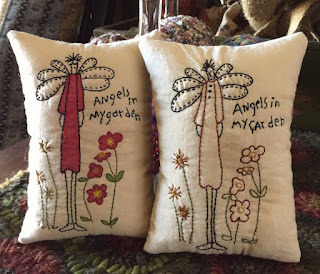 This was one of those stitcheries and I reduced it, so I could make some small lavender pillows to put in my wool boxes, yes, I have quite a few of them. This was fun and quick to do and I did two different types. 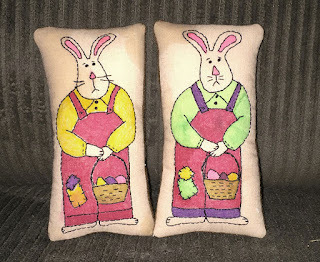 One is basic stitching and the other I colored. I think the coloring makes them fun. I use Faber Castell watercolor markers. They go on nicely, are steadfast and archival. These would make nice gifts for friends too, especially filled with lavender. You can find this and other freebies on Theodore's Blog, by typing in free in the search box. This one is found on the second set of blog posts. This weekend I was planning on starting my new paintings, but life got in the way, lol. Saturday Bill had to work, so we went to the beach in the morning which was perfect, since the tide was low. I got a nice stash of glass and a few stones, upper left pile in the photo. Then they cancelled, so we could have gone out again, but I was too tired. Sunday they cancelled again, so this time we went to the island for more beach combing. The problem was, there were scattered clouds, so one minute the sun was out, the next it was snowing. 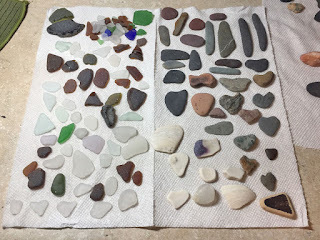 It was a bit tougher with the wind and snow, but with no one at the beach, we were able to find lots of old glass and stones. This time we dug into the piles of stones and found some nice ones hidden underneath. The piles on the lower, left and right, are from Sunday. The larger rocks are for painting on. I hope everyone had a wonderful weekend and hopefully Spring will be here to stay. I actually had two to finish, but life got in the way. I have been sick as usual and thought it was the lyme acting up, but it seems the tooth I have been complaining about, finally had it's last run. So, I had to wait to get in and finally had it pulled. Hopefully all the weird symptoms I have been getting are from that, for now I am waiting for the pain to wear off. You would think in this day and age, they would have come up with something with ripping teeth out with pliers, lol. I was able to finish off my angel painting. 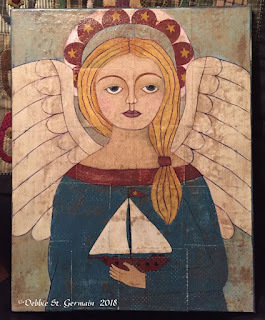 This was the first one I started by prepping the papers and drawing on the angel, but I never painted it. I had messed up with the drawing, so I finally redid the lines and followed the tutorial for the face. The problem was, my brain went on hold and I totally lost track of what I was doing and what she was saying, so I messed up on the coloring and shading. Since I did a nice enough job on the painting, I decided to just keep it simple and in a more folk art style. I added a hand and boat, and made stars on her halo, so a bit americana. Then came the finishing and crackle. I had crackle on hand, so used that and it did not work, it actually blobbed the finish, so I used warm water and washed what I could off. Luckily there is a gloss finish on the painting, so it didn't do too much damage. I ordered the right crackle and finished it with that, and I got some nice crackling in some areas and blobs in others. So, this is how she turned out, not like I planned but not too bad. This is my second one, so maybe the third one will be the charm. You can see the way it blobbed up in the upper left corner. What you need to know when you use crackle is, buy the right product for the right job. The plaid crackle is to put on top of a painted object like a box, then you add another layer of paint, to get the crackling effect. For a painting, you use Jo Sonya's crackle, which goes over your painting. 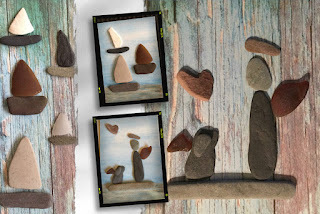 This is a technique that I learned in the online class by Teresa Kogut, of Gather Dream Create, so I cannot explain the actual process. I thought it was good to know for those who are using mediums, to read up on the types and what they are used for, before you buy. This is a close up of the actual crackle effect, I love how it looks and hopefully the next one will come out as nice. I plan on doing a simple painting with my own design first, to try out the technique, then I will try another angel. One good thing about Bill working weekends is, I get more things done. And I rather have him doing it now, when it is too cold out, then when it warms up. 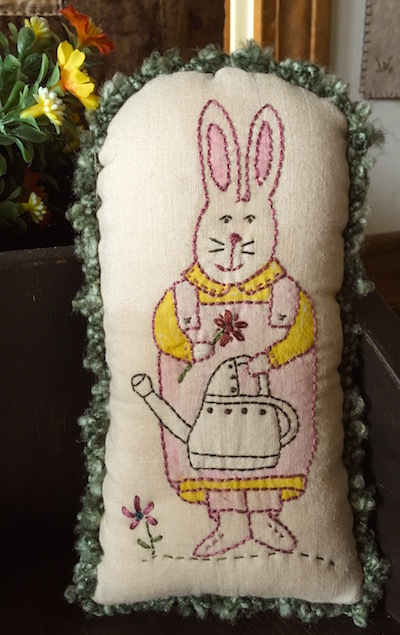 I have a folder with Cheri's free patterns and this time I made a stitchery pillow with one of the designs and added lavender. 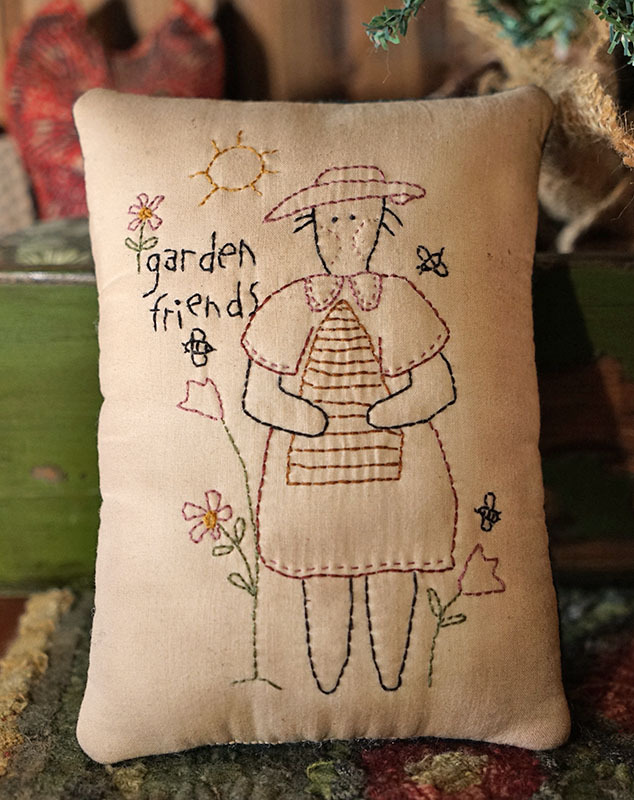 I think it will make a nice gift for a friend who gardens. The finished size is 7" x 5". I also wanted to make more bunnies, they are fun to make. This time I used wool, the brown shade is camel hair, so nice and soft, the blue is a wool that got felted, so nice and stiff. I also added a little heart, better colors for the boys if they want one. I was working on my angel painting and the crackle did not work right and made a mess. I ordered the right type and made the mistake of putting over the bad finish, so now I will have to see if I can sand it down or wash it off, definitely not what I wanted, so hopefully I can fix it up a bit and I will show you the results on Friday. The original free pattern can be found Here! This week I found a free pattern and of course I had to try it. It is a design by a site called Imanufatti. It is in a foreign language, but her instructions and pattern are easy to follow. She has a lot of other tutorials, I will have to check out the rest of her blog when I have a chance. These would be fun to make up for bowl fillers, to give away or the kids. I made a couple up in a day. I also took the pattern and made it into one shape, instead of separate ears and tail. I was thinking of doing a few more for the boys with a little heart, instead of flowers. 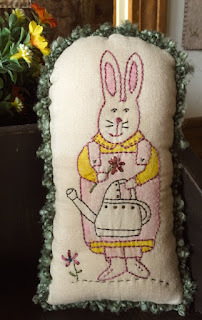 I used a piece of old felt that I had over dyed with yellow. It has a nice mottled and fluffy feel, since I washed it a few times. I also finished 8 more blocks for my Christmas stocking quilt. If I add three more to the side, it measures 35" x 54". I will pick three new colors for variety and then sew them together. That way I can see how the size fits and how much more I need to add. I don't plan on making a border, just a regular binding on this one. 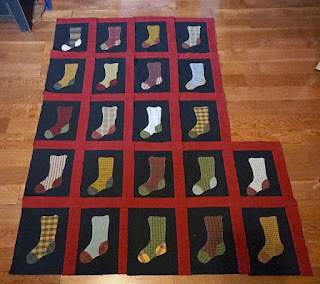 I want it to hang over a rail or couch and still be used, so big enough to be a large lap quilt. This is such a fun quilt to do, great way to use up scraps and it works up quickly. I am still debating on wether to machine or hand quilt it. Something simple and maybe a good project to take camping, I find hand quilting, very relaxing. I hope everyone has a nice weekend. Bill has to work again and it is going to be cold, so I am hoping my crackle comes in tomorrow and I can finish my angel painting. This weekend I was stuck at home, so I got a few things done. 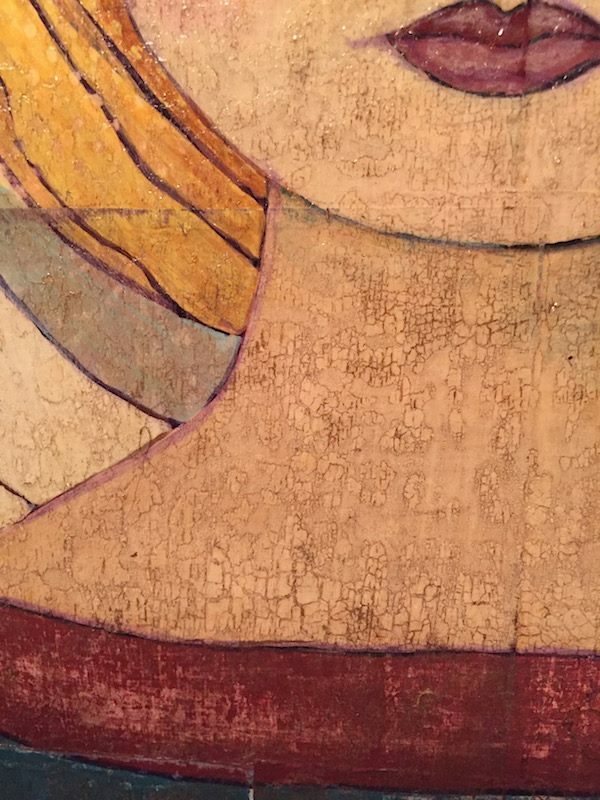 I also worked on my angel painting, but for some reason the crackle I got, did not work. I ordered some of the crackle that is used in the tutorial, so hopefully I can fix the mess I made. I also wanted to make some little boy bunnies. I could not find my old pattern, so I used a photo that I had of my wall quilt and remade it into a drawing. The design is adapted from Twigs and Sprigs. I used fabric markers on this one, so I will tell you how each one worked. For the yellow and red colors, I used Tee Juice. I didn't realize how small the tips were, so it took longer to cover the areas. It went on nicely and I liked the look, but it ran when I had to wet the piece to get rid of the blue marks. 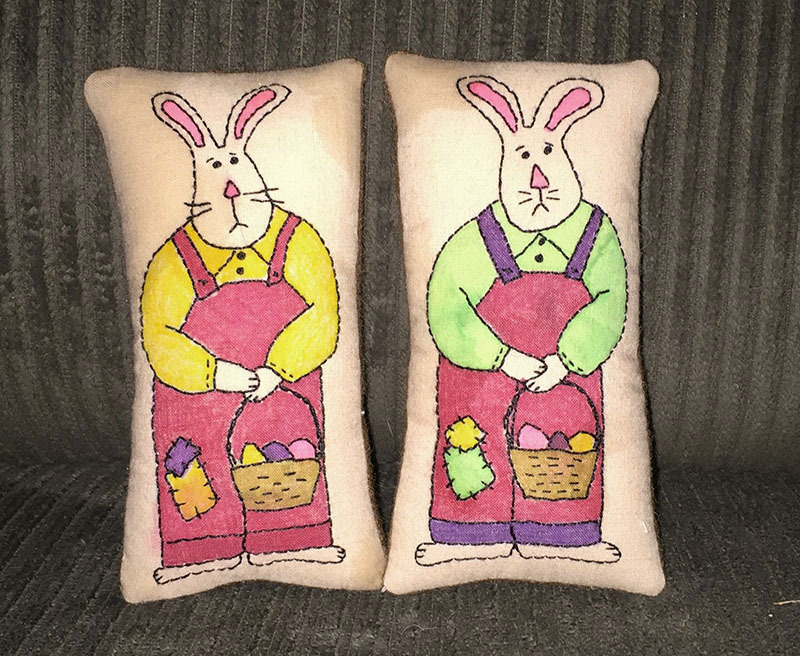 The purple, green and pink were tulip fabric markers. I did not like them. They went on roughly and seemed more dry, especially the green, so I would not buy those again. They also run. I think I will stick to my Faber Castell markers. They cost more, but they dry fast, can be washed and are archival. I made them for the boys, for fun, so I am sure they won't mind if they are not perfect. Another project I worked on was, my cubby base. Bill made it for me, it is a bit bigger and heavier than I needed, but it will do and has an extra area to store more art supplies. To stain the piece, I used Varathane weathered wood accelerator. I love how it works. I got a quart and only used half. All you do is brush it on, and it ages the wood. 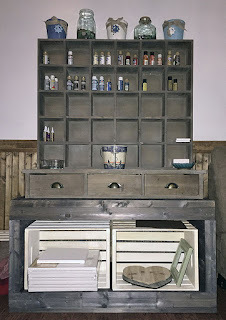 The color depends on the wood type, but it usually grays them and it is the perfect shade to go with the top cubby, that I bought. It is watery so you need an area you can work on, I used large sheets of painters paper under my piece. You can use a cheap brush and the Verathane is cheaper than other stains, so a good deal to get that weathered look. I put some paints in the cubby, have more to store. I also found the two green bottles today, so I stored my glass in those. I hope everyone is able to stay out of the storm heading our way tomorrow, looks like we are due for a bad one. I was able to get out this morning and find a nice batch of glass from the dog beach. I knew there would be more with the storms and it was nice to get out in the fresh air, for a little while. The flash messed up the colors. 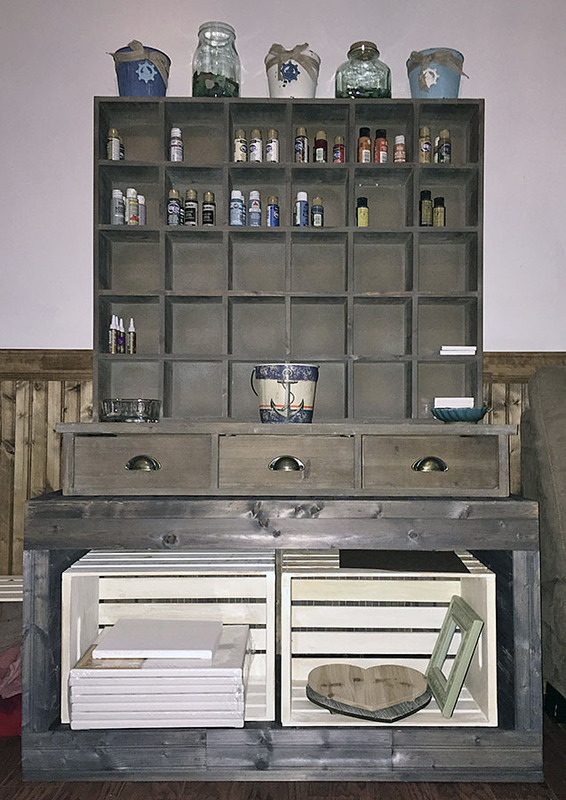 The two pieces are a medium, dark gray and the white crates are antiqued so not as white, as they appear. 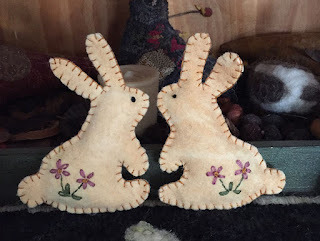 This week Kathy Schmitz gave us an extra, free pattern for those who are in the club. She had made it up for the club and realized we would like to make it now. It was a fun pattern and worked up in a day, I think I might make more. Actually I wanted to make a boy bunny and she gave me permission to redo it as a boy, but I found one of my old patterns and made a couple to work on this weekend. 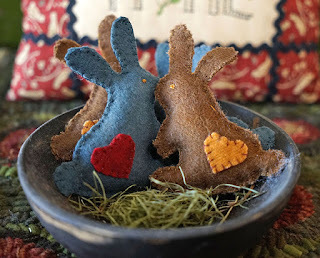 I think it will be fun to make little cut out bunnies for the boys. Not thrilled with my finish, so I may do two more, a boy and a girl in the method she used, as bowl fillers or shelf sitters. I used my Faber Castell art marker for the yellow and for the pink, I used my watercolor pencil. I was worried about it running, but I just dabbed my brush in the water, then dabbed it on a paper towel and it blended the color without going out of the lines. And I have been playing with my beach finds. I like trying them on different backgrounds and taking a photo to see how I like it. This way I can keep playing, until I get the look I want. I do like how it looks on the patterned paper, but I think the blue is too dark, so I will have to look for some lighter barn wood papers. I hope you all have a wonderful weekend. 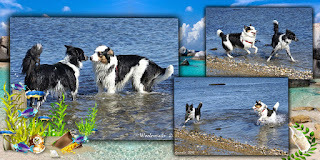 We have nice weather and of course Bill has to work over time, so no beach combing. I think I need a break and it will be nice to relax and work on my projects. The angel and dog wings are brown sea glass, that we found last weekend. I always love the first of the month, a new stitchery design from Kathy Schmitz and BOM's. I have been collecting some, but don't really have the time to do them all. I have bags of lavender and decided it was time to make a couple of sachets to put in my wool boxes. I have some in already and when I open the wool it smells fresh, in the ones without, it is a bit musty smelling. I think lavender is the best for keeping the moths away and for the smell. This is the design for this month, I kept it as is and simple, since they are going into boxes and won't be seen. They also worked up quickly, I actually finished the first and did the other and sewed them up after dinner. This weekend was still a bit windy and on Saturday a chance of showers. I wasn't going to let that stop me, it was low tide and after a storm, the best time to beach comb. The bad thing was, it did rain for short periods, the wind was blowing us around and the tide was higher than usual, so I couldn't get to the rocks at the edge, without getting my feet drenched. I did find some nice glass though, and lots of small rocks to play with. On Sunday we went for a ride and decided to walk along another beach. I found the perfect beach for small pebble rocks. The shoreline has several steep drop offs, so when the tide is out, there are piles of rocks, so I will definitely go back when it is warmer and I can pick through them better. I also found some small pieces of glass. 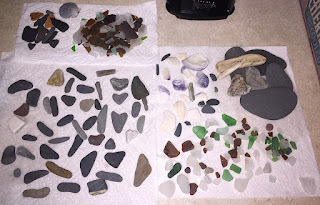 The first photo, upper left, has the small rocks and glass, as well as shells, I found on the second beach. 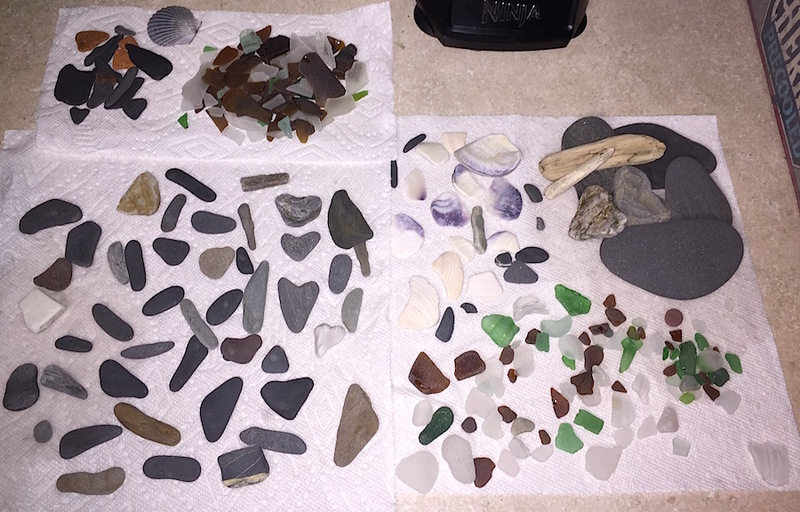 The rocks to the right are from the first beach and below left is the glass I found on that beach, after the storm. Then I made up some small things for fun, to show you what you can do with them. Now I need to sit down and come up with some fun pictures to make with them. I hope everyone is safe and warm at home, with the weather that is hitting the east coast. We have horrible winds, my grill went flying across the porch and later I saw our wheelbarrow go up and over, so a good day to stay in. I decided to post early, just in case the power goes out, so far, so good. With the nicer weather, I decided it was time to start painting rocks. I love leaving a few when we go out for walks. 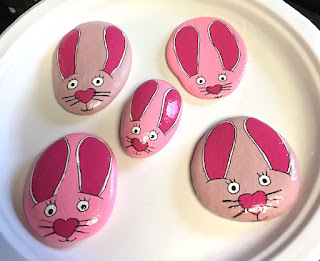 This time I made some simple bunnies. I like doing designs that make people smile and I am hoping, these will do the trick. I don't have as much control with my arm, but I didn't do too bad with that and my blurry vision, lol. If you would like to join in on leaving rocks or art items for others to find and spread the smiles, you can visit my group on Facebook, DSmiles4miles. It doesn't have to be items that you leave anonymously, you can also bring smiles to those in nursing homes or hospitals with a gift of time. We did have some wonderful weather this week, perfect for getting out to the local beaches and beach combing. The first day I found the most, I guess no one has been on the dog beach all winter.The large green piece on the bottom is the bottom part of a bottle bottom, our biggest find yet. Of course Bean loved getting out and he even found a new friend. Someone as hyper as he is.